I feel very lucky, the lovely people at Nissan have seen fit to give me a new Leaf on extended loan. It arrived today and I’ve literally only driven it a few miles so far. I mentioned it on the Twitters and had a very big response. So, to clarify things, it’s not my car, I’m borrowing it. The basics of the car are as follows. The Nissan Leaf is a front wheel drive 5 door hatchback that I would say is a bit bigger inside than a V.W. Golf. It has a kerb weight of 1,525 kilograms and will get up to around 90 miles an hour. It has an AC synchronous electric motor powered by a 24 kilo-watt hour laminated lithium-ion battery which is built into the floor of the car. 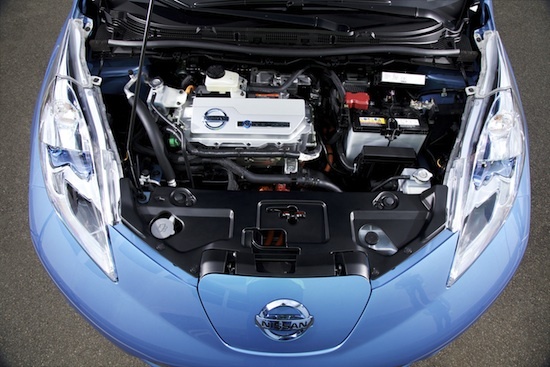 The Leaf isn’t a converted petrol or diesel car with a big lump of battery thrown in where the engine used to be. This was conceived as an electric car and that really seems to make a big difference. The handling is really solid, it feels really connected and responsive, the performance is, as I’ve come to expect from an electric car, impressive. No gears, it pulls away with gusto and just keeps going if you floor it. Which I don’t. The two charging inputs at the front of the car are for 240 volts and 13 amps, what we have in our houses, or 440 volts at 60 amps, which is for a heavy duty fast charger. The former takes a few hours, if the battery is totally flat, around eight hours, ie, overnight. The latter will fill the battery to 80% full in under 30 minutes. I want to point out that you never get to a fast charger with a totally empty battery unless you’re making a segment for Top Gear and you get four mates to push the car there. You work out your route before you leave and make sure you have the battery range to complete your journey. It's really, truly, not hat hard. I’ve used fast chargers before on the Mitsubishi iMiev, if the battery is three quarters empty, a fast charger will get to 80% in around 10 minutes. The Leaf is finished to a very high specification, the model I'm driving even has a solar panel on the rear spoiler that keeps the 12 volt ignition battery topped up. Quite a few people have asked why there is a standard 12 volt car battery mounted under the bonnet. This battery powers all the standard peripheral car electronics like headlights, indicators, sat nav, wipers, interior lights etc, just like an old fashioned car. It is re-charged from a small dynamo when you're driving. The solar panel just keeps it topped up when you are parked outside during the day. The interior is also very swish, the sat nav, blue tooth and driver feedback are absolutely state of the art. There are so many settings I can’t even begin to list them, but one that jumps out is the range map on the sat nav. A series of shaded concentric circles on the map give you an at-a-glance indication of your range, plus show you where any re-charge point is situated. The range is of course the obsession with everyone, particularly people who have never driven an electric car. Everyone seems to assume they drive 2 or 300 miles a day, every day. Of course there are people who do that, something like 5% of the driving population. The rest of us pootle about doing 30 or 40 miles a day and that is so easily accomplished in a car like this you truly don’t even think about it. Last year I had the Mitsubishi iMiev on a similar long loan. My Mrs and I drove it over 9,000 miles that year, all those trips to pick up kids, go shopping, go to Yoga class (not me, that’s the Mrs) we did in the iMiev. The whole range anxiety thing wears off really quickly, what you become aware of is how much you normally spend on fuel, and our petrol car is a Prius which uses very little. We’re soon having a special charger fitted into our garage and a meter to tell me exactly how much power we’re using to charge the car. We know from our electricity bill last year that the iMiev’s 9,000 + miles cost us in the region of £125, we’re still waiting for the exact figures. We always charge up at night on off peak electricity, something we will continue to do with the Leaf. One of the advantages of the Leaf is that you can set the time it charges from within the car using the onscreen display, this means you plug it in when you get home nothing happens until midnight when it will switch itself on. But there’s more. The Leaf comes with an iPhone app called Carwings that gives you complete control of the cars charging and climate controls. While it’s plugged in you can heat or cool the car from anywhere, this works brilliantly well and is really simple to use. So what if you don’t have off street parking and somewhere to charge? This is probably the second most common question after range anxiety. At the moment the only solution is to fit a charging post outside your house, not, I admit, a very attractive option. What if someone else parks in your space, what if they charge their car from your charger, what if, what if. All these problems are being dealt with, for a public charge post you need a little key fob to open it. It also won’t charge until you lock it. There are solutions being developed. What if someone cuts your charge cable? I’ve been asked that many time. Simple answer, they will get a very nasty electric shock. What if they unplug it while it’s charging? It’s a pain in the backside but not deadly, what if they lever off your filler cap and siphon your petrol out? So charging away from home or in the street is getting easier, there are more and more charge points around, but at present nightly re-charging is much easier if you have somewhere off the street to leave the car while it charges. You don’t need a garage, there are very good weather proof charging boxes you can fit to the front of your house. It’s going to take time, the take up is limited now but I predict it will get faster and faster in the next couple of years. Electric cars are still more expensive to buy than equivalent sized old fashioned cars, but I think they will only get cheaper, while drill and burn fuel is only going to get more expensive. When you look at the life time of an electric car, the savings you make over 100,000 miles more than outweigh the initial cost. The more people who use electric cars, the more normal they will become and the less threatening. I will update with more adventures shortly.